The politics of austerity have “slowed down growth and increased the deficit,” Nobel Prize winning economist Joseph Stiglitz told participants at the annual Iea-Isi Strategic Forum conference underway this week at the Bank of Italy. “Businesses are suffocating,” the national business association Confcommercio reported this week. To fight the economic downturn, investment in infrastructures, down to and including schools, are needed. ROME – In case anyone is not worrying about the Italian economy, here’s a depressing statistic, just released by Cerved. By the reckoning of this respected Italian business reporting service, over 4,000 business failed in just three months, April through June, or over 14% more than during the same period of 2013. The national business association Confcommercio concurred, reporting that the first half year of 2014 showed 8,000 business failures. So what is to be done? Even as Germany’s economic policy of austerity prevails within the EU, discord over it is increasingly heated. 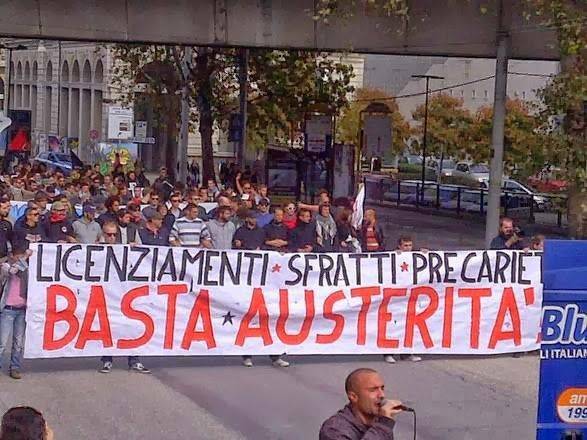 In a private conversation the other day a ranking Italian economist was literally sputtering with frustrated rage at the enforced austerity policies, which hamper investment. She is not alone, as a growing body of dissenting opinion shows. At the annual Iea-Isi Strategic Forum conference underway this week at the Bank of Italy, keynote speaker Ignazio Visco, governor of the Bank of Italy, warned that, “We are in unexplored territory. We need to refocus our economic policies,” he continued, in order to stimulate aggregate demand and investments.” This will require creating a context more favorable for private investments plus, “We must reverse the drop in public investments too, and stimulate [investments] in the infrastructure,” he said. The failure to invest in the infrastructure limits funding for, not least, spending on education, where the lack adds to the difficulty of recovery. Still in many ways recognized for quality in education, Italy shows signs of faltering, and a recent OCSE survey, reported by the ANSA press agency, placed Italy twenty-third down the list of thirty countries in relative efficiency in education spending. This sophisticated study of the price/quality ratio calculated the link between spending and schooling because the more efficient the school, the better the level of education tends to be. In his address Sept. 23 to the Strategic Forum, the Nobel prize-winning economist Joseph Stiglitz agreed with Bank of Italy president Visco, observing also that Premier Matteo Renzi is “on the whole doing what is right, though his hands are tied.” Europe, on the whole, is showing slow growth, and Germany itself is in recession, he added. The larger European picture shows economic failure linked to the politics of austerity, “slowing growth and increasing the deficit” while the consequent drop in tax revenue, including in Italy, has left little room for maneuver, he said. French economist Thomas Piketty, who rocketed to worldwide fame as the author of the surprise best-seller, 700-pages long, Capital in the 21st Century, takes the argument a step further. For Piketty, the EU fixation on the public debt is aggravating the problem. In an interview with the daily “La Repubblica” last week, Piketty said that in order to reduce the public debt, “as Italy is attempting to do, would take decades.” His studies of the history of money and public debt over the centuries show, he said, that interest payments for repayment of the debt cost more in the long run than the debt itself; in the end the debt cripples the economy. However, Piketty argues, “My book shows that the fundamentals of Europe are better than we tend to think, with patrimonies and income never before as high as they are now…. You can’t just say, ‘Let’s have less austerity and more investments’ -- it’s easy for Germany to say no to this. So Italy and France should show more courage and put on the table right away a project for political union. At that point the Germans too would be in trouble.” His proposal, based on the concept that economic union without political union cannot work, would be for a form of political union beginning with Italy, the UK, France, Germany and Spain. The more disconcerting economic news is that, thanks to a new accounting system, Italy’s GNP has been adjusted upward by 3.7% or $75.8 billion (E59 billion) for the year 2011, with similar positive results for 2013 due to be reported any day now. How did this happen? By taking into account the illegal income from narcotics, prostitution and cigarettes. Added to the hidden income from the underground economy, this contributed almost $200 billion (E15.5 billion) or 12.4% to Italy’s GNP.